Your refrigerator is essential to your bed and breakfast. How safe is it? The following is a check list of some refrigerator does and don’ts. 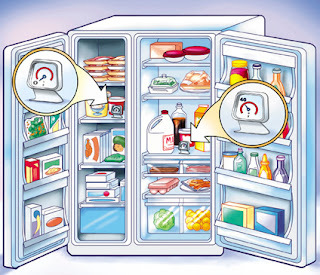 • Most importunately, the temperature in your refrigerator should be kept between 35° - 40°. The freezer should be at 0°. 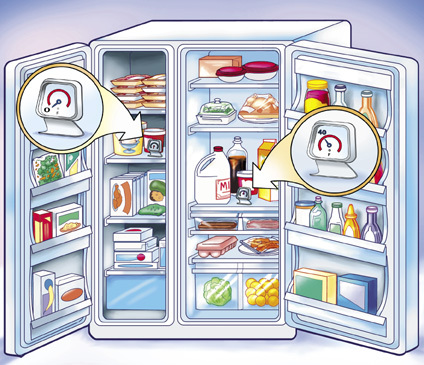 Refrigerator thermometers should be placed in both the refrigerator and the freezer compartments. The thermometer should be placed in the middle of the compartment for maximum accuracy. Cooling is lost every time you open and close the door. To maintain optimum temperature in your refrigerator, do not open doors any more than is absolutely necessary. • Proper air circulation is essential. If the contents of the refrigerator are too tightly packed together, efficient cooling will not occur and spoilage will be accelerated. Do not block the air vents in either the refrigerator or the freezer. Additionally, the compressor unit will have to work harder to keep the optimum temperature. • Clean the refrigerator regularly. Also, clean up any spill or leakage as it occurs. • Consume the food prior to its expiration date. Use an indelible Sharpie marker to indicate the expiration date. This is especially important on items such as milk, cream, and cheese; which, accordingly to many health departments, should be discarded no more than a week after opening. • Fruit and vegetables should be stored in the crisper of your refrigerator (place a piece of paper toweling on the bottom to absorb and liquid). If your refrigerator does not have a crisper, use plastic tubs (which can be found in stores like Walmart, Target or Crate & Barrel). Fruits and vegetables breathe require air circulation. If your refrigerator has crisper drawers, this will help to prolong the life of your foods. Tupperware makes a line of containers specifically designed for the refrigerator. This line is called FridgeSmart www.tupperware.com This product line regulates the air flow needed to keep your fruits and vegetables longer. Items such as celery, carrots, cucumber, and grapes require less air flow, while lettuce, beans broccoli, spinach, asparagus require more air flow. • While door shelves are convenient, they are also the warmest area in the refrigerator. Do not put highly perishable foods there. They are designed for condiments, soda, bottled sauces, etc. Every time the door is opened, the temperature of these products changes immediately. Be sure to check any opened containers often. • Meat and eggs should be stored on the bottom shelf of the refrigerator. Again, place the meat products in plastic tubs. Eggs need air circulation around them. It is recommended that you not remove them from their cartons for optimum air circulation.